WILLIAM HALL, BFA 1973, continues to build his legacy of “making art available to Alabama students and citizens,” according to William T. Dooley, director of the Sarah Moody Gallery of Art, through donations to the gallery’s Permanent Collection. 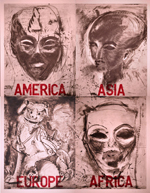 Dooley described the print by Jim Dine given by Hall enthusiastically: “Its rich surfaces and the content of the work are provocative, a perfect example of Dine’s sensibilities about art and printmaking.” Dine’s Four Continents, a four-panel work in which the internationally known artist has combined etching, drypoint and other techniques, was part of Hall’s personal collection until just last year. In the summer of 2010, Hall gave the print to the [Moody Gallery’s Permanent] Collection, just one of several works he has donated in recent years. Continuing his relationship with the university, this summer, Hall will co-teach a class with colleague and friend AMY PIRKLE, UA MFA Book Arts and adjunct professor of art, at Penland School of Crafts in North Carolina. The class, titled “Plate & Type Together: Exploring Traditional Techniques,” will combine the traditional printmaking methods of copperplate etching and letterpress printing with metal type. –reprinted from The Loupe, Spring 2011. More about our notable alumni and faculty.